Anne Anderson was one of the most popular and prolific illustrators of books for children between both World Wars. She collaborated with her husband on many projects. Most illustrators of books for children never become famous outside of professional circles. This doesn't mean they can't make a demand for their work on the market. Anne Anderson with her recognizable style achieved more than that. She was actually famous. Today her work is almost unknown outside of the collectors, but I strongly believe Anne Anderson's illustrations carry so much timeless quality it is only a matter of time when publishers will start reprinting her masterworks. Why? Well, let me present my case with a list of top ten illustrations by Anne Anderson! The illustration above is from one of dozens versions of famous Canterbury Tales. Considering it was published just after her marriage with Alan Wright (1912) we can presume it was one of their first collaborations. Anne Anderson and Alan Wright illustrated many books together. He was established painter and illustrator much before her but he lost reputation when he illustrated something he shouldn't (controversial Baron Corvo's story). So he started working again when she started getting commissions. Their style was very similar (typical Art Deco) and their friends said he generally drew animals and she did the rest of the job. Do you like Anne Anderson's illustrations? At first look we can say the style of Anne Anderson's painting didn't change much in decades. But this would be wrong. She loved bright livid colors through all of her life and she adored contrasts. It is easy to notice curves of just about everything, including the lines of objects which should be straight. But we can also notice the contrasts in later years of her career were not so strong and even color red, one of her favorites at the beginning of her career, wasn't so aggressive anymore. The illustration on the left is from one of best parodies of the romantic novels ever. It is titled Aucassin and Nicolette and it was probably written in 12th century. The illustration on the right shows similar fluid scene with lady on the run: Cinderella, which is even older. In both cases faces are drawn with only very limited number of strokes with a brush but we can say the faces on the right are even more expressive despite the fact they are drawn with less moves. Anne Anderson obviously mastered her painting technique and she also moved from more realistic three dimensional paintings to two dimensional which are more favored by children (another famous illustrator Walter Crane wrote several essays on this subject). This is probably one of Anne Anderson's most famous illustrations. 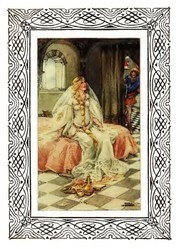 The famous scene from Rapunzel inspired many artists and the illustration on the right, published in 1925. The Fairy Tales of Jacob and Wilhelm Grimm stayed with her for the rest of her life. She illustrated many Grimms' tales in different editions (sometimes black and white and sometimes in color) and she even rewrote several of them to adapt the stories to the taste of the contemporary audience. This means we can find different illustrations of the same Grimms' fairy tale in different books, sometimes in very eclectic combinations with very different stories from all over the world. The next illustrations come from one of these. The book is titled Wonder Book and the stories are Sidi Nouman and The Wind's Tale. The legacy of Anne Anderson is impressive. She illustrated more than one hundred books altogether! Less known and hard to find scans of some illustrations made by Anne Anderson. Hi, blackspanielgallery, sorry for my late response - and thanks for stopping by. Yes, you are right, nowadays things look much more simplified, almost industrialized, but I wouldn' t go so far to claim which times were better for illustration. Well, times of Anne Anderson's best works were not called the golden age of illustration for nothing, I suppose. I am pretty accurate with today's illustration as well, and I believe we have a lot of great and even more bad products on the market. Only time distance will really tell what is real art and what just a filler. But I have seen hundreds old works which were really really bad, so, in my opinion, we are just lucky the only true judge of art - time - helped us to find mostly good illustration from the so called golden age. The bad stuff is already (almost) forgotten. Wonderful images. It seems to me many current illustrations are simple, red is one shade, blue one, and so on. I noticed the colors slowly changing shades, as they would in art. Old ways were much better than current ways, where illustrations look more like paint by numbers. TV programs from various countries with different languages are readily available in the application.You can likewise select Category to watch any kind of certain show or movie. Hi, stacy, sorry for my late response. I don't have any physical copies of Anne Anderson's books, all presented material comes from archive.org, from public domain resources. If you want a real book, Amazon and eBay would be the first places to start, but some bookstores with used boos could hide many treasures a s well. Sometimes she is not signed as illustrator, so it's best to find as much as possible about her bibliography on-line before you buy anything. I am so happy to have found your work on Anne Anderson! I had a book with her illustrations as a child. I took it to school and the teacher asked if she could hold onto it for a few days , I never saw it again and have been searching all these years. I didn't know who wrote or illustrated it so it was like a needle in a a haystack ! I want very much to find a copy of one of her illustrated books. Could you suggested where I might search.? Thank you! The paintings look really beautiful, its great to know about these works! Also I am inspired by "Art deco" - one of my favourite topics of home decor. I am inspired by the Rapunzel, never tired of watching the movie. Beautiful and artistic - "Thumbs up" to AnneAnderson and you.